IT’S BEEN almost 18 months since the last one, but that doesn't mean ol’ Rory Gallagher’s spent his time going grand on us. Quite the opposite in fact, ‘Jinx’ must be his rootsiest album in years. It simply oozes with the blues, a real gutbucket job if ever I heard one. 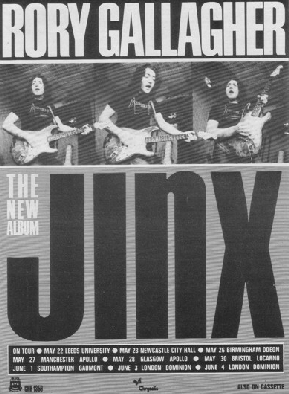 Produced by Rory himself and recorded in Germany, ‘Jinx’ flies in the face of fashion. Confronted with the trickery and technology of the modern studio he's chosen to take a step backwards in time and go for the stripped down sound of a naked three piece. Which doesn't mean that you don't hear an overdub here and there. But just like the Rolling Stones classic ‘Exile On Main Street’, this album sounds like it was recorded in one small room where there was nowhere to hide. On ‘Jinx’ Rory Gallagher fuses the hard rock rhythms of the 80's with the licks he first learned with Taste during the Blues Boom fifteen odd years ago. On belters like 'Signals' and 'Bourbon', he squeezes them out of his old Stratocaster like there's no tomorrow, while on something like 'Double Vision' he slides into them a little slower before changing down again into a title track that sounds like Peter Green's Fleetwood Mac back from the grave. Gerry McAvoy on bass and new drummer Brendan O’Neill match his every move and prove their versatility on 'Devil Made Me Do It'. But the best is a delicate 'Easy Come Easy Go' where Gallagher and the lads recall their Irish heritage. If you've ever wondered what Phil Lynott and Van Morrison might sound like teamed up with Rory Gallagher on guitar…this could just be it.